The “Most Dynamic Teacher”: the name of an award given by the students of a particular graduating class that most succinctly and accurately summarises Mrs. Florence Nkowane. A teacher by profession, but a polymath in her works, Mrs. Nkowane is a Ugandan national who lives in Zambia and travels the world. Her passion lies in working with the youth, and this has led her to be involved in a diversity of projects including teaching, theatre, diplomacy, social work, pageant, sports and church activities. Mrs. Nkowane began her formal education in Uganda and Kenya and ultimately obtained a B.A. in Education from the University of Zambia. 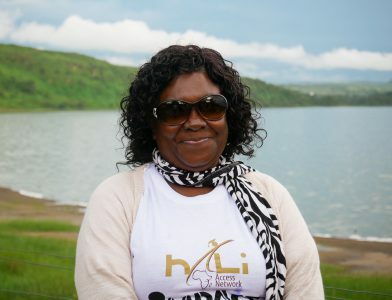 A teacher of Social Studies in general, and History in particular, she has had over 22 years of experience, having taught in some of the most academically excellent schools in Zambia. Mrs. Nkowane has been Head of Department several times and was a Grade 9 examiner for the National Educational Council of Zambia. For the 17 years before working with KF, she taught IGCSE and IB History and Business Studies at the International School of Lusaka. Always interested in learning and growing, Mrs. Nkowane went back to school to complete her Master’s Degree in Interdisciplinary Sciences from Buffalo State University, which she finished in 2012. Formal education activities aside, Mrs. Nkowane has been involved in almost all aspects of school and student life during her time as a teacher. This has included, amongst many other responsibilities, being a member of the school’s Board of Governors Marketing Committee, Supervisor of Student and IB Councils, coordinator of the school’s ‘Tuck Shop,’ Model United Nations and Model International Court of Justice founder and coordinator in Zambia, and organiser and head of several community service programmes. Apart for Model United Nations, Mrs. Nkowane has also led projects in community service that have earned international awards for her students, her school and herself. Mrs. Nkowane has been in charge of the International School’s Community Service and IB CAS programme and has headed dozens of social service initiatives, most of which involve educational service to underprivileged youth. It is one such project, the building of part of the MAPODE Street Kids Centre that won her school the IB Blackburn CAS award of 1999– an award competed for by schools from many different parts of the world. For her outstanding work with Kucetekela Foundation, she was awarded the “Most Inspirational Individual” by The Egmont Trust in 2016. In addition, in February 2018, she was awarded an Honorary Doctorate in the Humanities by CIDP and UNESCO for her exemplary career work as a humanitarian. It is this dynamism and passion for working with youth that prompted another vibrant youth, Tamweka Sichinga, to recommend Mrs. Nkowane to Mr. Oliver Barry to be a co-founder of the Kucetekela Foundation in Zambia. She was honored to be invited to work with such a dynamic young American with great ideas. Mrs. Nkowane enjoys drama, listening to music and playing chess in her free time, and is deeply involved with her Church in many activities.